All young fruit trees require staking for the first few years of their life, this new telescopic tree stake will 'grow' with your tree and is manufactured using 100% anti-corrosive materials. 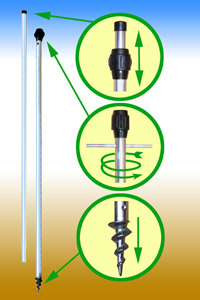 The stake is fitted with a unique power drive screw head and a Tommy bar is supplied, so it can be screwed into the ground with the minimum of effort. Length min. 1.2m (4ft), max 2.4m (8ft), Diameter: 2cm (3/4in).